A gourd is a plant in the same family as a pumpkin. Due to the hard texture of gourds, they can be used for everything from table centerpieces to outdoor decorations; a hollowed-out gourd makes the perfect homemade birdhouse. Gourds are easy to paint and hold just about any type of paint well. With a few supplies and some imagination, you can easily create a custom-painted gourd birdhouse that will attract all kinds of feathered friends. Choose a workspace that is level and easy to paint on, and where you can leave your birdhouse to dry overnight. Decide what you want to paint on your gourd birdhouse. You may want to paint it one solid color or you might want to paint designs on it. Use stencils if you don't have drawing capabilities, or hand paint images onto the gourd. Sketch your design onto the gourd with a white colored pencil before you begin painting, to give you a guide you can easily paint over as you go. Paint your gourd with acrylic paint as desired, using a wide brush if you want to color the whole gourd and a thin-tipped brush for more detailed designs. 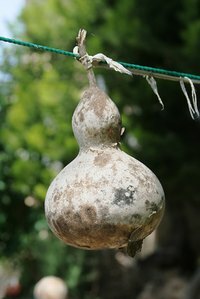 Dry your gourd birdhouse for several hours (about five) to let the paint set. Paint your gourd birdhouse with a clear coat of weather-resistant varnish so that it will last longer outdoors. Let the varnish dry before hanging your birdhouse. Though gourd surfaces will accept any kind of paint, acrylic paint is your best choice: it holds well to the gourd and is easier to work with than other paints.